One of the easiest ways to relieve a burden of unnecessary stress is by cleaning up the home you live in, or the office that you work in. Living in a messy environment, or even working in one, has been proven to give have the possibility to give you a lot of stress. Although it is very important to keep your home and/or office clean, we understand how time consuming it may be. Many people do not have any spare time to take out of their day to clean up their homes or their offices. Although this is disastrous, we sympathize with you. That is why we created MaidsApp, which is an app that allows you to book a maid on demand, or schedule one for the future, to come clean up your home or your office. MaidsApp offers quality cleaning services in the city of Los Angeles, along with the rest of the Los Angeles County. You can never go wrong with utilizing our cleaning solutions in an effort to clean up your home or office, and relieve that unnecessary burden of stress! MaidsApp is the app that provides a quality house cleaning service Los Angeles customers can enjoy. The creators of MaidsApp understand how hectic it can be to fit in time to do home or office cleaning when you have a heavy work schedule. MaidsApp is a quality cleaners service that can help you get the cleaning job done. MaidsApp offers maids to order on demand, and even booking cleaning services in the future. Many people may ask, “how much does house cleaning cost”, but MaidsApp makes it as affordable as it is easy. Trust MaidsApp today for your Los Angeles house cleaning duties! Allow our maids to give you a quality, service master clean. We offer unbeatable carpet cleaning specials, which you can find out more about if you call our number below. Whether you are a busy parent, a full time employee, or a full time student, MaidsApp can help you clean up your home and your office. With convenient cleaning services from MaidsApp, you can do your regular everyday activities while our professional maids clean your home or office for you! We understand allowing someone you aren’t familiar with into your home can be a bit of a worry for some people. 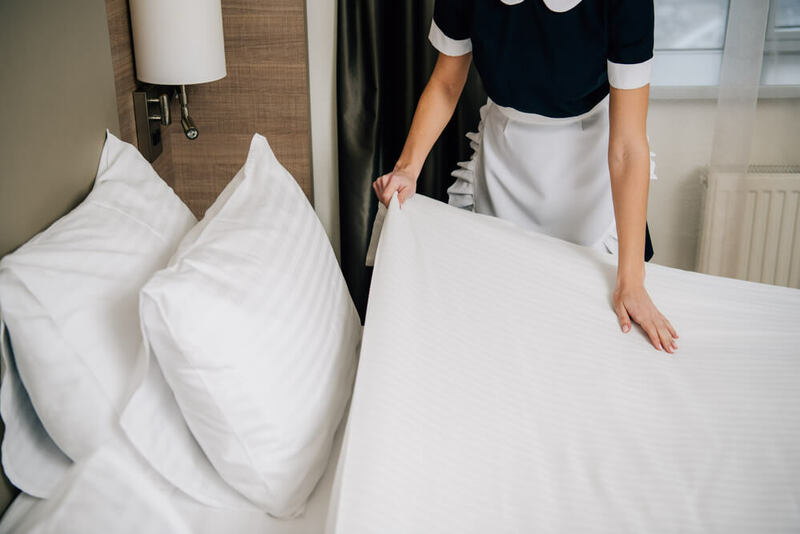 Therefore, to give our customers peace-of-mind, we complete an in-depth security and background clearance on all of our maids, who are truly a servicemaster at what they do. Our MaidsApp representatives constantly analyze and monitor how our maids perform their services, the feedback we get from our customers about our maids, and the feedback the maids give to us, in order to provide the best possible service that one could ever think of. Others use apps like Zillow to find affordable housing, but here at MaidsApp, we use analytics provided by apps like Zillow to make sure we have enough information about your home to make the cleaning process as seamless as possible. Using this information, we give our maids directions on how to go about their cleaning to make the process as seamless as possible. With our services in house cleaning, Los Angeles customers can easily have their homes and offices cleaned! All of our maids have a great deal of experience in residential properties as well as office spaces and commercial locations, and have been in the quality cleaning services for a long time. They know how to get the job done in the cleanest, easiest, quickest and most efficient way. Call us today for all your maid services. We offer unbeatable services for office or house cleaning in Los Angeles.